MOSCOW, Idaho – Lloyd Hightower is listed at 173 pounds on the Idaho spring football roster. That’s 12 pounds lighter than his listed weight last year as a true freshman. But don’t confuse the 5-foot-11 cornerback’s slimmer physique with diminished strength – or less effective play, for that matter. “He’s one the strongest guys (pound for pound) on our team,” cornerbacks coach Aric Williams said. He’s also the most-improved Vandal from last year to the start of spring football, according to coach Paul Petrino. Hightower is one of several UI cornerbacks whose emergence or return to full health signals good things for the team’s secondary in the fall. 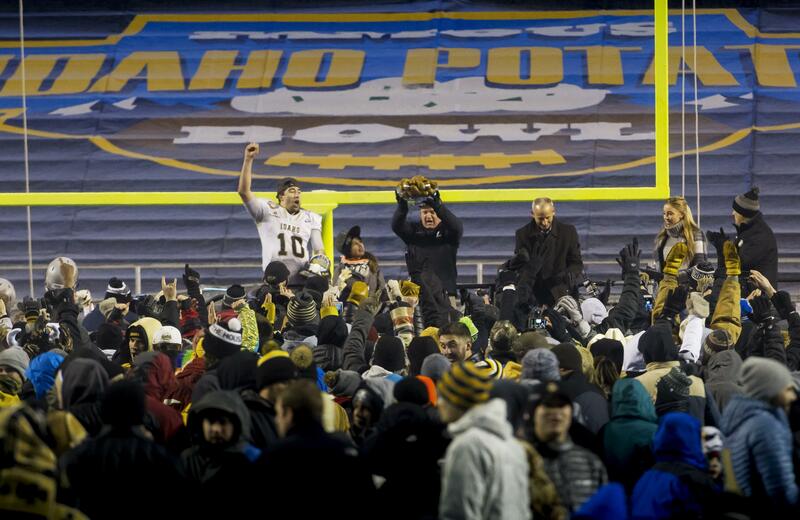 The Vandals won the Famous Idaho Potato Bowl and went 9-4 last year, their best season in almost two decades. The secondary, though, ranked in the bottom 10 of the FBS in passing yards allowed (283.5 per game). Even in the Potato Bowl in Boise, Colorado State carved up the Vandals for 445 yards through the air, most of which came late after UI built a 41-7 lead. Hightower, originally signed as a wide receiver out of Temecula, California, made a splash last year on special teams with a blocked punt against Georgia State, which he returned for a touchdown. The sophomore-to-be has shown the same big-play knack in the first two weeks of spring. It’s the little things Hightower does off the field that impress his position coach the most, however. Hightower has been getting first-team reps in spring practice opposite Dorian Clark, a 6-foot junior who missed all of 2016 with a shoulder injury. Williams said Clark, the Vandals’ best cover corner, is completely healthy. Clark and Hightower will compete in fall camp with 6-2 junior college signee Tyrece Parker and 6-foot Wyryor Noil, who’s wrapping his senior year at Madison High in Portland. Both will arrive in the summer. “I think we got a steal right there coming out of Portland,” said Williams of Noil. Williams also likes what he’s seen in spring camp from two redshirt freshman cornerbacks – Sedrick Thomas and Vaughn Daggs II. Daggs is only 160 pounds, but he’s speedy and “has that attitude you look for in a DB,” Williams said. At safety, the Vandals have converted running back Denzal Brantley and quarterback Gunnar Amos to add depth to the defensive backfield. Jordan Grabski, who’s battled injuries for much of his career, is healthy and taking snaps alongside key returner Armond Hawkins. Idaho’s first spring scrimmage is Saturday at 10 a.m. at the Kibbie Dome. Published: April 6, 2017, 6:35 p.m. Updated: April 6, 2017, 8:51 p.m.